Download "IN THE SUPREME COURT OF TENNESSEE SPECIAL WORKERS COMPENSATION APPEALS PANEL AT NASHVILLE June 2003 Session"
1 IN THE SUPREME COURT OF TENNESSEE SPECIAL WORKERS COMPENSATION APPEALS PANEL AT NASHVILLE June 2003 Session JUANITA BOLING, Appellee v. SAK S INCORPORATED a/k/a HECHT S and LIBERTY MUTUAL INSURANCE GROUP, and SUE ANN HEAD, DIRECTOR, DEPARTMENT OF LABOR, WORKERS COMPENSATION DIVISION, SECOND INJURY FUND, Appellants Direct Appeal from the Chancery Court of Williamson County No , 28318, Hon. Robert E. Lee Davies, Chancellor No. M WC-R3-CV - Mailed - December 1, 2003 Filed - January 6, 2004 This workers compensation appeal has been referred to the Special Workers Compensation Appeals Panel in accordance with Tenn. Code Ann (e)(3) for hearing and reporting findings of fact and conclusions of law. The issues presented pertain to a 71 year old employee of Sak s Incorporated who sustained two separate injuries. 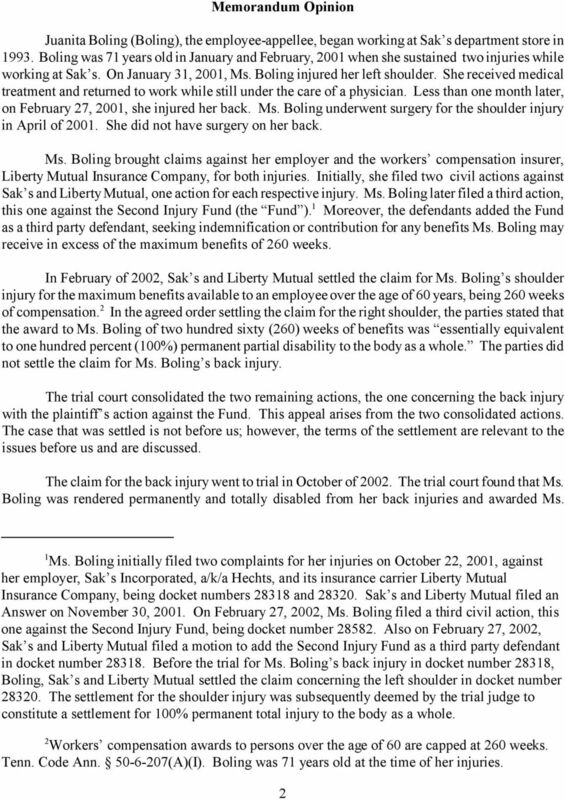 The employee and Sak s settled the first case, involving injuries to the left shoulder, for the maximum benefits stating in the settlement that the employee was 100% permanently partially disabled. The matter on appeal involves an injury to the back that occurred within one month of the prior injury. The trial court found the employee permanently and totally disabled from her back injury and awarded her the maximum benefits. 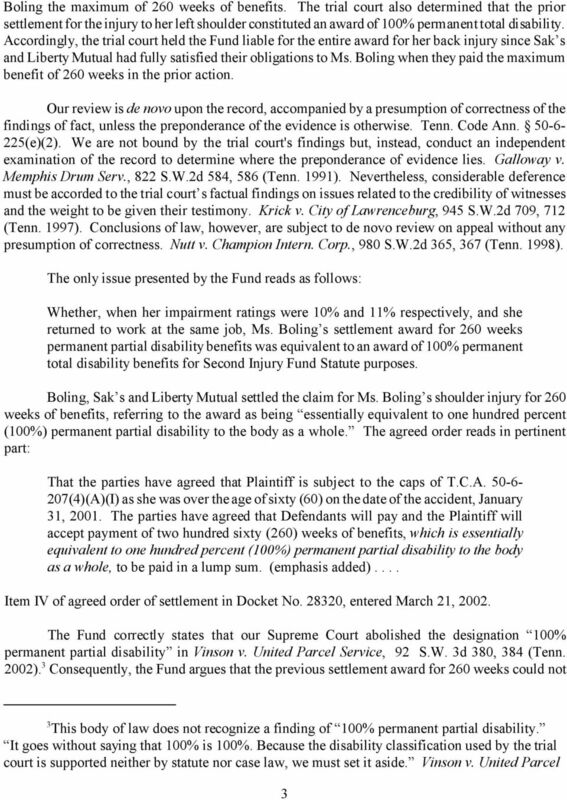 Moreover, the trial court construed the prior order as a finding of 100% permanent total disability to the body as a whole and held the appellant, Second Injury Fund of the Department of Labor, liable for the entire award for the back injury. 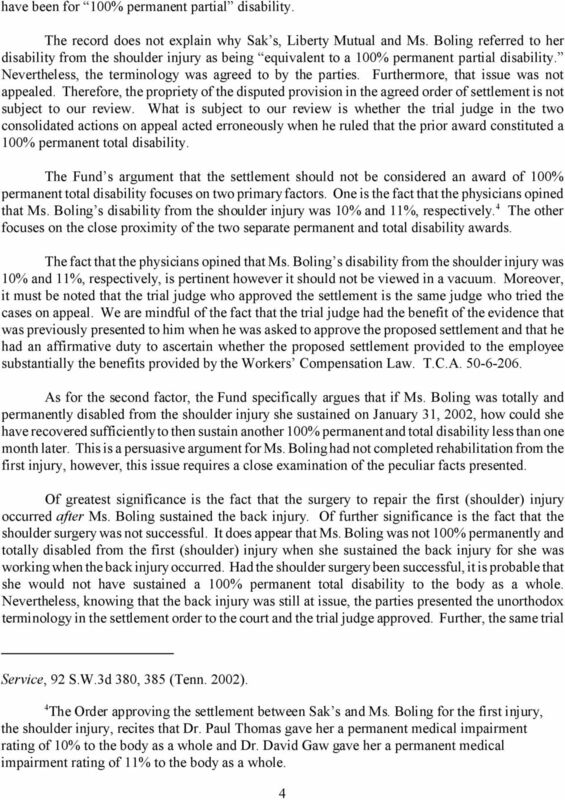 For reasons stated herein, the panel affirms the judgment of the trial court as modified. 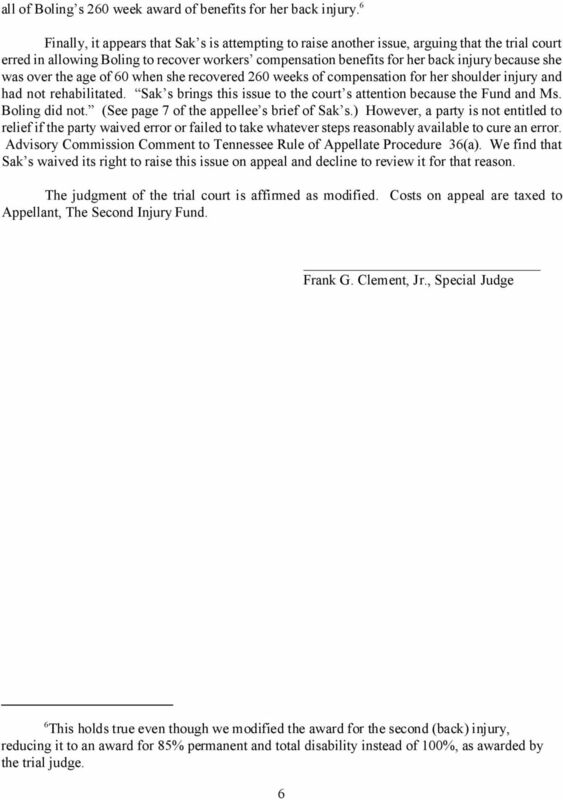 Tenn. Code Ann (e)(3) Appeal as of Right; Judgment of the Chancery Court Affirmed. Frank G. Clement, Jr., Sp. J., delivered the opinion, in which Frank F. Drowota III, C.J., and Joe C. Loser, Jr., Sp. J., joined. J. Frank Thomas, Leitner, Williams, Dooley & Napolitan, PLLC, Nashville, TN, for appellant, Sak s Incorporated. Paul G. Summers and E. Blaine Sprouse, Attorney General, Nashville, TN, for appellant, Second Injury Fund. Daniel C. Todd, Todd and Floyd, PLC, Nashville, TN, for appellee, Juanita Boling. 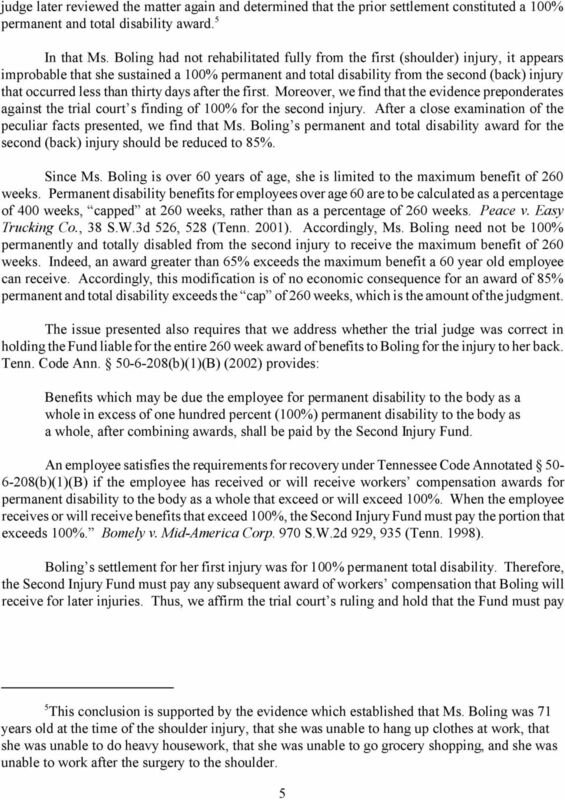 IN THE SUPREME COURT OF TENNESSEE SPECIAL WORKERS COMPENSATION APPEALS PANEL AT NASHVILLE ( November 30, 2000 Session) ANGELA McCOIN v. LUMBERMENS MUTUAL CASUALTY COMPANY and WILSON SPORTING GOODS, INC. IN THE SUPREME COURT OF TENNESSEE SPECIAL WORKERS COMPENSATION APPEALS PANEL KNOXVILLE, MARCH 1996 SESSION FILED BILLY CLEVINGER, ) July 10, 1996 Plaintiff-Appellant, ) Hawkins County Cecil Crowson, Jr. IN THE SUPREME COURT OF TENNESSEE SPECIAL WORKERS COMPENSATION APPEALS PANEL AT JACKSON March 26, 2012 Session GAIL FLY v. TRAVELERS INSURANCE ET AL. Appeal from the Chancery Court for Gibson County No. IN THE SUPREME COURT OF TENNESSEE SPECIAL WORKERS COMPENSATION APPEALS PANEL AT KNOXVILLE January 13, 2014 Session JUDY McCLENDON v. FOOD LION, LLC Appeal from the Chancery Court for Hamilton County No. 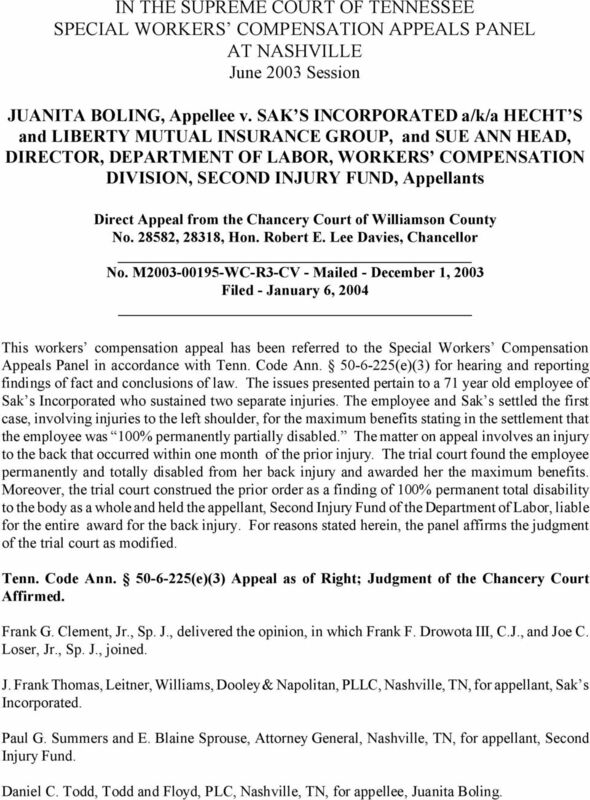 IN THE SUPREME COURT OF TENNESSEE SPECIAL WORKERS COMPENSATION APPEALS PANEL AT NASHVILLE April 26, 2010 Session MELVIN HILL v. WHIRLPOOL CORPORATION Appeal from the Chancery Court for Coffee County No. IN THE SUPERIOR COURT OF THE STATE OF DELAWARE IN AND FOR NEW CASTLE COUNTY STATE FARM MUTUAL, ) AUTOMOBILE INSURANCE ) COMPANY (as subrogee of Tera ) & Nanette Robinson), ) ) Plaintiff, ) ) v. ) C.A. Case: 15-10510 Document: 00513424063 Page: 1 Date Filed: 03/15/2016 IN THE UNITED STATES COURT OF APPEALS FOR THE FIFTH CIRCUIT United States Court of Appeals Fifth Circuit FILED March 15, 2016 Lyle W.
STATE OF MICHIGAN COURT OF APPEALS KENNETH ADMIRE, Plaintiff-Appellee, UNPUBLISHED February 15, 2011 v No. 289080 Ingham Circuit Court AUTO-OWNERS INSURANCE COMPANY, LC No. 07-001752-NF Defendant-Appellant. 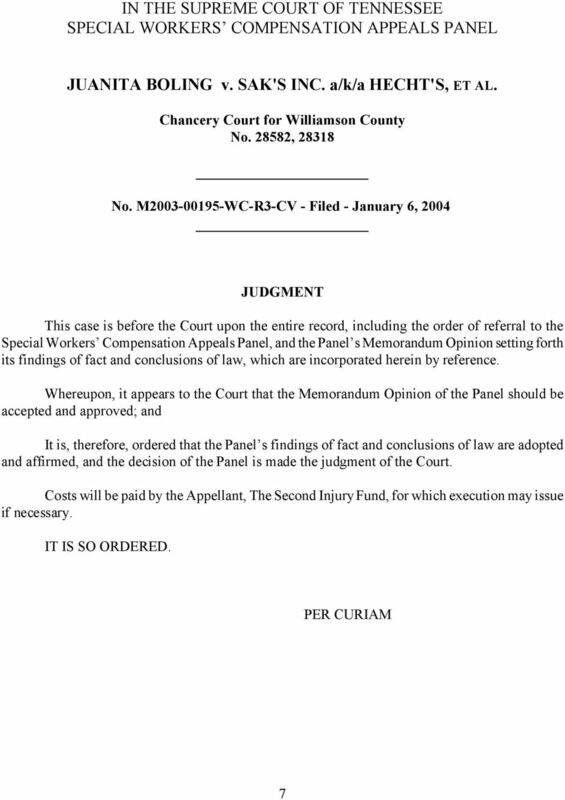 IN THE SUPREME COURT OF TENNESSEE SPECIAL WORKERS COMPENSATION APPEALS PANEL AT JACKSON April 23, 2007 Session MARY PENNEWELL v. HAMILTON-RYKER Direct Appeal from the Circuit Court for Henry County No. UNITED STATES OF AMERICA MERIT SYSTEMS PROTECTION BOARD THOMAS J. SWEET, Appellant, 89 M.S.P.R. 28 DOCKET NUMBER CH-0353-97-0438-C-2 v. UNITED STATES POSTAL SERVICE, Agency. DATE: July 5, 2001 Thomas J. IN THE COURT OF APPEALS OF TENNESSEE EASTERN SECTION AT KNOXVILLE ----------------------------------------------------------------------------- BOBBY R. REED, ) ) KNOX CIRCUIT Plaintiff/Appellee ) ) No.